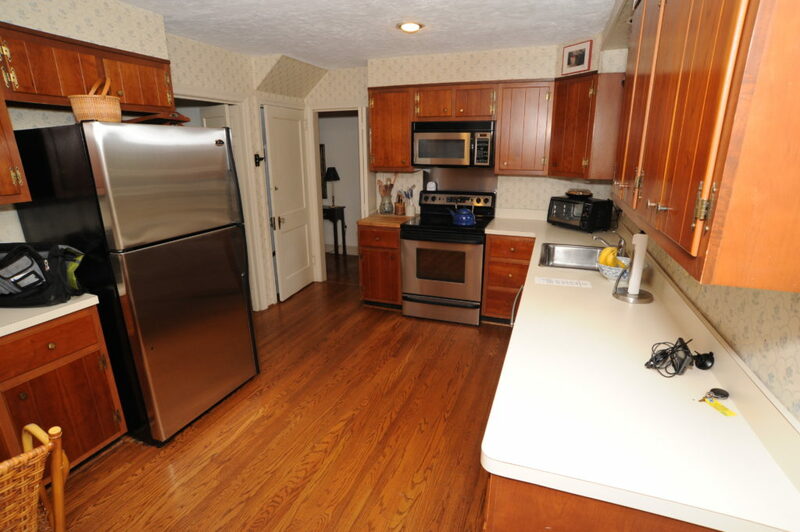 Some of the warmest and most lasting memories of home are made in kitchens and dining rooms. 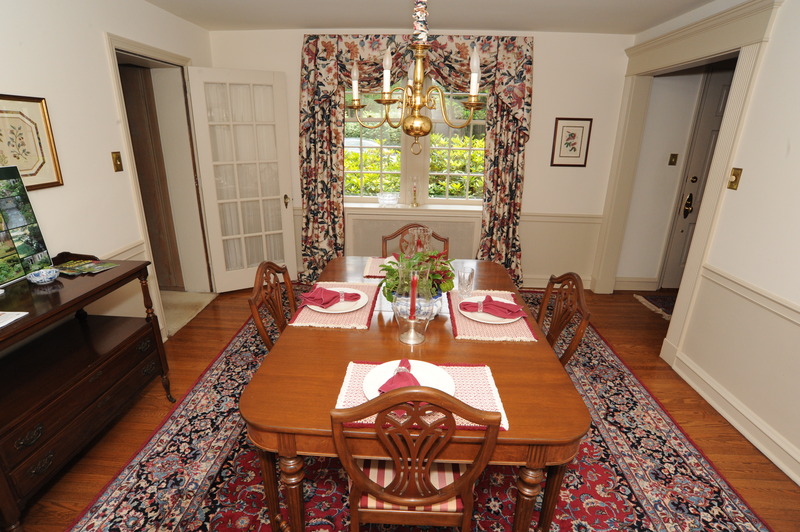 The whole family comes together in these rooms daily to cook, enjoy meals, and share stories. 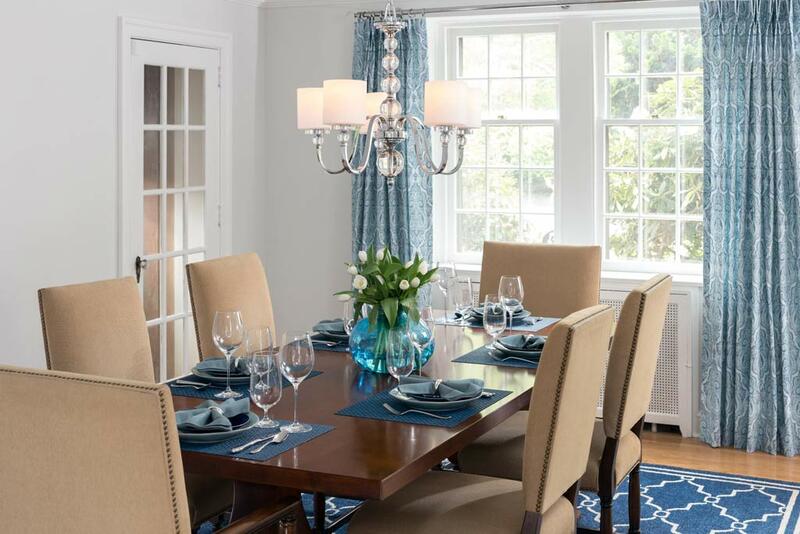 The team at Lisa Quale Interiors completed a beautiful kitchen remodel for a Delaware County couple, transforming their kitchen and dining room into a warm and appealing space for their family. The first step in our kitchen design plan was to take down the wall separating the kitchen and dining room, which made the rooms feel more open and airy. The client’s 1950s kitchen had dark wood, a soffit, and dated wall coverings, so we looked for ways to brighten up the kitchen and take advantage of its soft natural light. We visited the granite yard with our client and she was excited to find beautiful white and gray quartzite that she loved for her countertops. 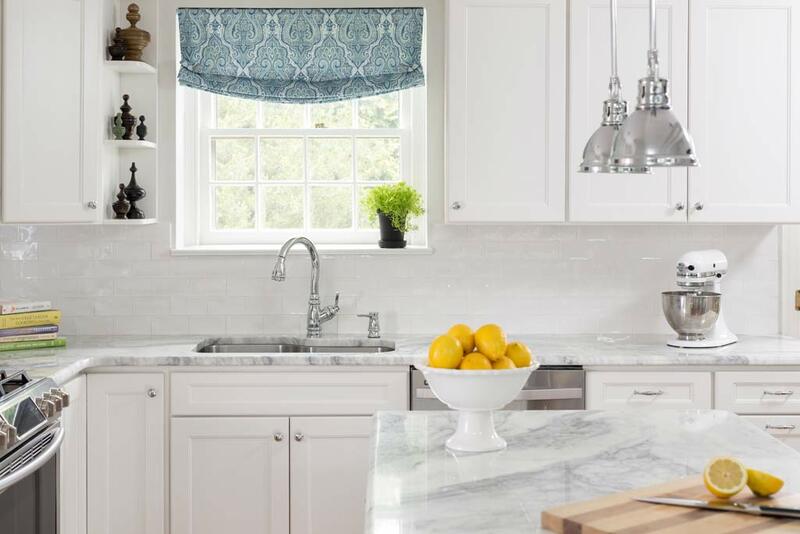 Quartzite is a natural stone that is quickly becoming more popular for kitchen remodels–it looks like marble but is less delicate and porous, which makes it easier to care for. The new quartzite kitchen island creates a place for the kids to do their homework and enjoy family time. Lighting under the cabinets and tumbled subway tile on the white backsplash give the room a softer look. We installed polished chrome hardware throughout. To add warmth to the white and chrome color scheme, we found rustic wooden stools and stained the floors to match the existing wood floors in the dining room. In the dining room, we installed an acrylic and chrome chandelier for a glamorous and contemporary feel, and added drapery rods with matching acrylic finials. The table and chairs from Restoration Hardware are suitable for both casual and more formal entertaining, and pinch pleat draperies highlight the large window and match the relaxed roman shade in the kitchen. The indoor-outdoor rug is perfect for dining areas with kids and pets, with a pattern that is trendy but affordable to replace as styles change. The completed dining room and kitchen design is comfortable and inviting, while also being an elegant space to entertain guests. Our clients love how the rooms flow together to create a place for their family to relax and bond. At Lisa Quale Interiors, we work closely with our clients to transform and create beautiful spaces. Email us to set up a consultation, or read more about Lisa Quale, interior designer for Delaware County.